This is a terrific thread. I have often wondered about this myself, and I am glad to see that it is a question that many others (who know more than I do) have. I like alot of what Jean just said, and feel that I am basically elaborating. There is something I would like to note here, and that is there a discernable sweep of time and geography that we see with these weapon classes, and their definitions. I think this is another example similiar to the thread from before Christmas where the definition of "rapier" got an examination. Falchions seem to be an infantry weapon of relatively early period, but I would like to call to consideration how they seem to decline in prominence as medieval times turn to the renaissance. It seems as though the Messer has greater longevity, particularly from the German speaking areas heading East. I would like to make the contention that England, France, and the states of Italy professionalized their militaries to the point that a poor-man's chopper was an obsolete piece of equipment compared to what the organized military was capable of issuing. I recognize what Jean noted about how Falchions evolved into other weapon types like the Dussack, etc. I think that if we were to do Oakeshott style classification of this weapon type, we would have to make a distinction between the early types, and the latter--something that can show the evolution from Saex to "golden age" falchion to Dussack/Schwiezersabel. I think that this organization and professionalization of units did not happen at the same rate in the areas that used Messers, and it stayed in service far longer as a result, partly from military unit organization, possibly from the warrior ethos of the culture which seemed to value this weapon. I know this sounds long winded, but I think the definitions/differences of these weapons is less about characteristics, and more about how particular pieces fall on a certain arc or continuum. I agree; I think form and function are more important than the term we tack onto a weapon. Most of these falchions, choppers, and messers seem to have worked in a similar way. They seem to have been designed to deliver a devastating cut/chop, sort of the "meat cleaver effect", if you will. This is just a generalization, and there were many variations of the basic design. However, I think the study of what they may have actually called these things can be interesting, as well as a bit frustrating at times. 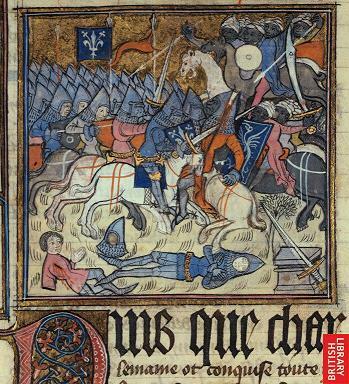 There are many, many arms and armour terms used just in the historical records of medieval Europe (just take a peek at the glossary in the back of Nicolle's Arms & Armour of the Crusading Era 1050-1350: Western Europe and the Crusader States. I'm sure many of his definitions are speculative at best, but he makes an effort to figure out what the terms meant in the day of their use. Anthony North did make a comparison between the European falchion and some Near Eastern swords. Oakeshott and Blair point out the similarity between the falchion blade and the earlier long sax. In a much older source, Ancient Armour & Weapons, John Hewitt states that the falchion is a weapon of great antiquity. He actually equates it with weapons seen in paintings on the tomb at Thebes of Ramses III, BC 1230. He also states that it can be found in an almost identical shape in the wall paintings of the Ajunta Caves of the 1st century. Hewitt indicates that the word falchion may derive from the French fauchon (see the list of period names from Nicolle), and ultimately the Latin falx. Now, many of these weapons that Hewitt calls falchions are undoubtedly called something else today. I believe the falx is a separate weapon in its own right. However, I think there is some sort of form and function link between these ancient examples and the medieval falchion. The idea of a curved, broad-bladed cutting weapon has been around a while, in many different forms. I was looking through some images at the British Library's online catalogue of images, and found an interesting image of a falchion-type sword with a narrowed "spear" point. This is similar to the falchion in the manuscript image Oakeshott illustrated in Archaeology of Weapons. Take note of the orientation of the falchion and how it is being wielded. Of particular note is the cutting edge and the direction of the clipped point. To many of us, this would appear to be held wrong, but indicates the cutting edge is actually the "short" edge, not the long one. This is an excellent depiction of this type. Thank you for finding it. Here are some other odd birds. One is distinctly a falchion but what happens when it curves the other way??????? Thanks for posting the image right on the thread. I wasn't sure about doing that. Yeah, the "short" edge is definitely the cutting edge. It looks as though the back was brought out to a point to allow for a bit of thrusting. Take away the sharp point, and it would look similar to the Conyers Falchion, with it's cleaver-like blade. 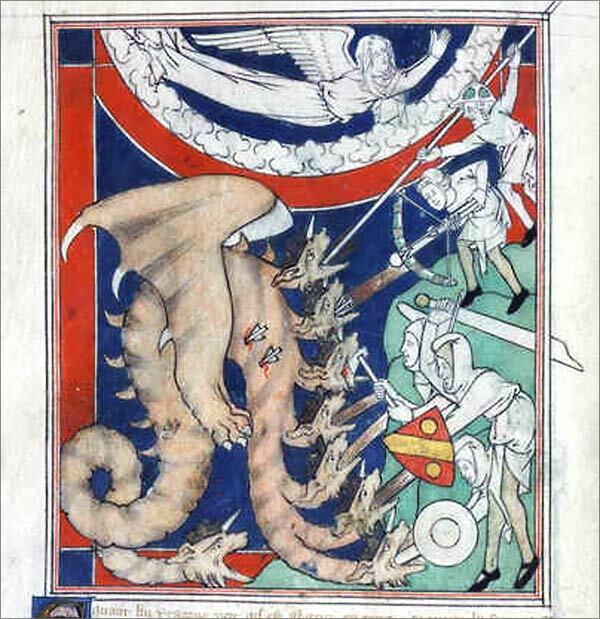 Description: (Whole folio) Five knights fighting an eight-headed dragon with spear, cross-bow, axe and sword. Above, the woman flying in an inverted arc of cloud. Text below. I think I may be obsessed with this stuff! Some of those swords in that image have the look of a "knightly" medieval sword (straight, tapered, fullered blade, and cruciform hilt) "bent" in a curve. It could be just a device used by the artist. Of course, the curved swords do seem to be used by knights on both sides, so maybe they are a garbled version of an actual falchion. Medieval art can be hard to interpret sometimes. Do you have the specifics regarding that image? What is it meant to show? 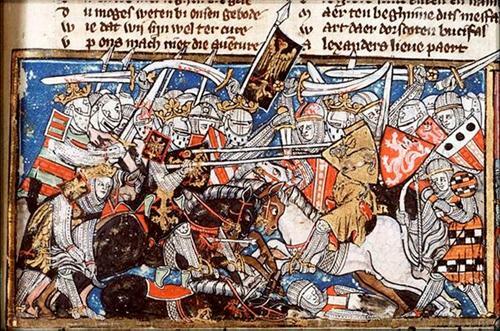 Is it a Biblical, Crusading, or other historical scene? Neat stuff! I might be able to find several more examples of this sort of thing, especially curved swords in the hands of the "saracens". I'll have to do more digging! Stay safe, and keep the images coming! Okay, I've found a couple images that show curved swords in the hands of Muslims in two different manuscripts from the British Library. The first is an early-mid 14th century manuscript. Note that the swords carried by the Muslims are rather slim and tapered, sort of like a typical knightly sword bent into a curved sword. 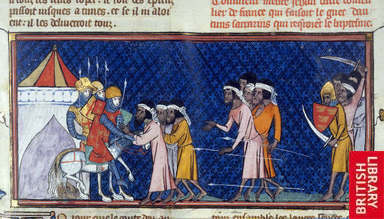 The second image is from an early 15th century manuscript. Note that at least one Muslim carries a weapon that's clearly a falchion. It's actually a very nicely depicted falchion of a later style. A mid-late 14thC falchion with the edge on the convex side in the Musee de l'Armee, Paris. It could be a bit earlier, based on its similarity to the falchion in the manuscript image. Yes to most of your comments above I was thinking the same thing when I saw the recurved blade in the pic I posted, some type of artistic convention. Problem is they do not seem to fit that as they are both depicted in a similar spot and they even have blood on the edges as well as clearly depicted grips and the rest of the swords in picture are all straight. The outsider is often depicted with a curved blade in art but I and several others have surmised this maybe a way to difference the Euro "Knight" from those how are assailing the christian world. There is quite a bit of evidence that the europeans are the ones who introduced the curved sword to some of these cultures. I think there is a real need to recognize that the early appearance of a type in art is only setting a date that indicates it existed at that point in some form. The straightish curved blade of the messer and the curved clipped point of the falchion are blade styles that I think may well have been seen from some of the earliest periods of steel bladed weapons. There is quite a bit of evidence that the europeans are the ones who introduced the curved sword to some of these cultures. As an aside to your comment, I think the curved swords of Central/Eastern Europe don't get the recognition they deserve. I'm not talking later swords, I'm talking earlier medieval curved swords. Many of these were probably influenced by the various steppe cultures that migrated into Hungary and surrounding areas. This beautiful sabre has a non-tapering blade with an angled tip. In many respects it recalls some fine, and very much later, Japanese swords. The origins of both groups of weapons almost certainly lay in Central Asia. The bulbous quillons are of an unusual and probably early form. Esztergom, which was founded as a bishopric in the year 1001, is not far from Visegrad, the first capital of Hungary. Not surprisingly, some magnificently decorated weapons have been found in the area, this sabre perhaps being the finest. Curved quillons with bulbous ends...continued to be made for many years, and they were clearly related to those on some of the earliest Islamic sabres. A simpler and probably slightly later weapon still has quillons related to those of the magnificent Esztergom sabre. The blade is, however, of a later form with a broadened tip and angled back, designed to deliver a more powerful blow. Such weapons were characteristic of the Middle East from the 12th century onwards and were presumably developed in response to a wider use of armour. The cultural connection between medieval Hungary, the Turkic nations, and the world of Islam is demonstrated by this sabre. Not only is it a typical weapon of nomadic steppe peoples but its assymetrical quillons and the short sleeve covering part of the blade below them are feature seen, either together or separately, in surviving weapons and art from Western Asia and the Middle East. This was used by one of the Kun, which was the name given to those Turkish Pecheneg tribes which fled into Hungary and then settled there. For several centuries they retained a separate identity and maintained a transhumant pastoral way of life comparable to that of the original Magyars. This long, slender sabre is a typical Turco-Mongol type of weapon, although the uncharacteristically long quillons may be a local development following the Kuns' settlement in Hungary. There is another very splendid sword attributed to Charlemagne in Vienna. Tradition has that it was a present to him from Haroun el Raschid, Caliph of Baghdad, but it is not an oriental weapon in spite of its curved blade and oddly shaped hilt, which are very reminiscent of seventeenth- and eighteenth-century Persian or northern Indian swords; early oriental swords were invariably straight. It is of a type much used in Hungary during the ninth and tenth centuries, a fact proved by the finding of many similar ones in graves of the period. The most similar is from the grave at Tarczal in the Tokay Mountains; this had silver scabbard mounts similar to Charlemagne's but it - or at least the grave - was of a later date (tenth century). How much influence might these sabres have had on the development of the falchion and messer? Who knows? I hope this was of interest! Well, I was able to answer my own question to Craig about the image he posted. I discovered that the image is ultimately from the National Library of the Netherlands. It is manuscript The Hague, KB, KA 20. This is a West Flanders history of circa 1325-1335. The image Craig posted depicts the battle between Alexander and King Porus. And, yes, the manuscript had more interesting images, incuding a more tradional-looking falchion. 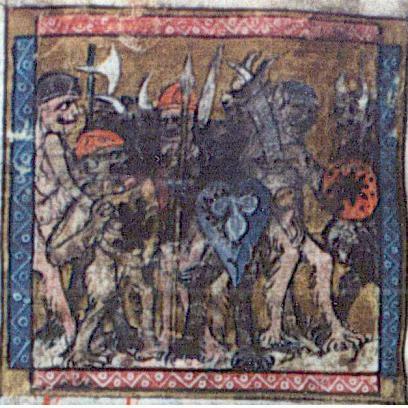 The first image if from folio 154r: min. It depicts Lucius dressed as a king and Walewein killing a Roman soldier. Note the falchion amongst the raised swords. It appears to be the reverse of the falchion in the apocalypse image and the Musee de l'Armee; the "beak" of the tip appears to be an extension of the cutting edge. The next image is from folio 211v: min. 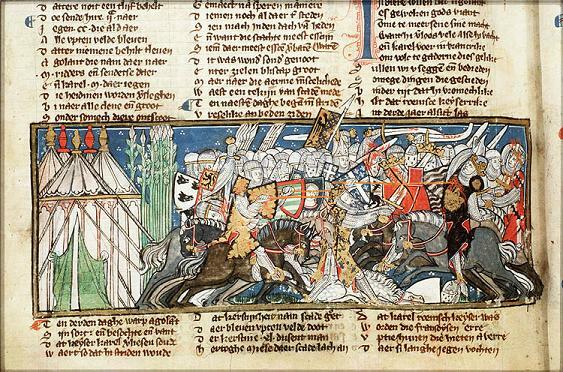 It depicts the miracle of the flowering lances and battle between Charlemagne and Agolant. Note the slightly curved sword, and the sword with a "hooked" tip amongst the raised swords to the right. The last image is from folio 34r: min. It depicts Alexander killing Porus. Note Porus's curved sword. Is it the artists's attempt to depict an "eastern" weapon, or was it something that might have been used in Europe? 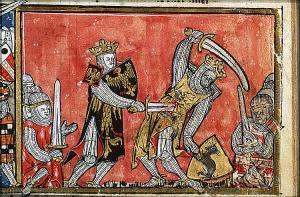 Okay, I found an example of a curved sword, a falchion in this case, being carried by "the wicked" in a medieval manuscript. In this case, it's a falchion being carried by a demon or devil - certainly as wicked as you can get! Fol. 26v - L'armée infernale. Diables cornus armés de piques, fourches et de boucliers variés, ornés de crapauds et de chauves-souris. The manuscript of the 14th-century mystery play 'The Day of Judgment,' includes roles for 94 characters, 89 miniatures depicting the action of the play and three neumed musical pieces. Richard, Thanks so much for all of this effort you've been putting into this. Your help is greatly appreciated, along with everyone elses! On a side note, I am very happy that this has been made into a spotlight topic. Now more people with my original question can have it answered. Out of simple curiousity, are the artworks here from anyparticular area or all over europe? I actually tried to give that information whenever possible. The manuscript images I've shown are from England, France, and West Flanders. Some of the images Nicolle referred to included these areas as well as Italy. I am also aware of one on a sculpture of a warrior circa 1345 from the Musee d l'Oeuvre Notre-Dame, Strasbourg. This warrior carries a falchion in a buckled scabbard. This was one I didn't list earlier because it was well into the 14th century, and I wanted to list early depictions of falchions. The last picture in this post shows on the right a curved sword held over the head with a very symmetrical looking blade with maybe a central ridge: Now, a heretical thought. Could the artist be showing movement with the curve or the bending that happens with a thin blade moved and suddenly stopped ? Most of the other examples of falchions shown in the other pics wouldn't conform to this hypothesis and can be seen as true falchions. Just trying to think how a period artist might depict the bending of a sword ! In some ways this reminds me of the type of thing one might see in comic book art where movement is shown by exaggerating bending or motion lines etc ...... Some of this Early Medieval iconography does remind me of cartoons or the way a child might draw rather than the almost " photorealistic " art of the Renaissance. Anyway, just an idea to consider as a remote possibility in interpreting some period art. The last picture in this post shows on the right a curved sword held over the head with a very symmetrical looking blade with maybe a central ridge: Now, a heretical thought. Could the artist be showing movement with the curve or the bending that happens with a thin blade moved and suddenly stopped ? While on the phone with Craig, he brought up the same possibility. Who is to know? When the blade profile is of some type of clip point or expands i.e. become wider near the point and may also have a curved blade we can be reasonably certain that the artist was intending to make it look like something he saw or knew about. It may be possible that it's artistic license but when it shows up at various time periods by different artists and some written sources speak of falchions the " proof " seem reliable. With a drawing that looks like a double edged sword in all ways normal except for the curve of the blade we have to at least wonder. It is kind of flattering and pleasing that Craig brought up the same possibility. Curved swords as a way to show movement, or the bending of swords in movement? That's an interesting idea! 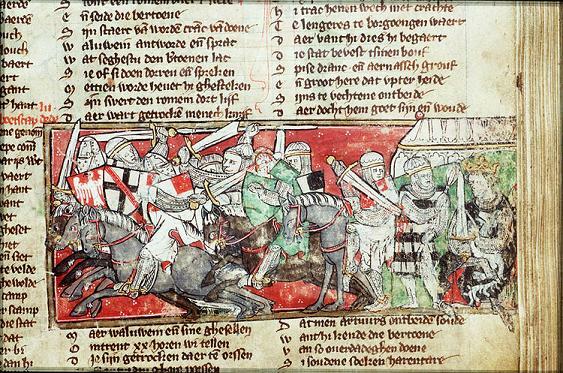 There are some manuscripts images, however (like the Treacherous attack by Saracens from the Chroniques de France ou de Saint Denis, vol. 1) that seem to show curved swords only in the hands of the "Saracens". In these instances, there does seem to be a foreign or exotic symbolism attached to the swords. There are always examples that refute this, but its hard to know what went on in the illuminator's mind. Remember, most illuminators were monks; many would not necessarily have known what a sword in action would have looked like. There are, again, exceptions to this, the Maciejowski Bible perhaps being one (the illustrations seem to have been made by someone who knew the details of military equipment).